As many HFP readers know, the independent airport lounge in Gatwick’s South terminal, No 1 Lounge, is a victim of its own success. Whilst the lounge is part of Priority Pass and Lounge Club, it is often difficult to get in due to overcrowding. No 1 has taken to asking people to pay £5 online via this page to guarantee admission. Priority Pass got around this by doing a tie-up with The Grain Store restaurant. You can go there, spend £15 on food and drink, and ask them to send the bill to Priority Pass. The good news is that – according to a well placed source – Aspire is currently building a lounge in Gatwick South to open this Autumn. My guess is that this will be in the old Virgin Atlantic space, which is also the lounge that British Airways used on a temporary basis after the switch to the South Terminal (reviewed here). This is good news for non-status British Airways passengers who like No 1 – because they will have more chance of getting in – and indeed people who don’t like No 1, because they will now have an alternative! 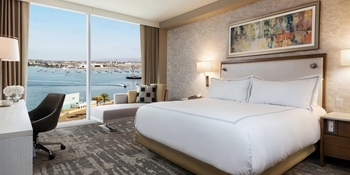 If you’re planning a trip to California in the near future, you might want to take a look at the brand new InterContinental San Diego which opened this week. Details are here. A new 400 room hotel overlooking the bayfront, it is described as “the first luxury product in the market”. The hotel includes a rooftop pool, sundeck and pool bar. Cash rates are around $250 plus tax. Alternatively, it is a 50,000 IHG Rewards Club points redemption. Given my usual minimum target of 0.4p per IHG point, this is OK. If you are there over a weekend, remember that IHG’s Ambassador scheme comes with a ‘buy one night get one free’ weekend stay voucher. You can buy Ambassador here. The InterContinental San Diego website is here. I was updating my old article on which airlines you can spend Avios with (it will appear soon) when I spotted something new. Iberia now has an Avios redemption partnership with Interjet, the third largest airline in Mexico. This is restrictive but may work for some. If you are flying to or from Mexico on an Avios ticket using Iberia (BA’s Mexico City service does not count) then you can add on a connecting redemption on Interjet. Details are on the Iberia website here. How to fly long-haul planes on short-haul redemptions! OT With the new Curve weekend surcharge, which timezone is it using? UK, wherever you’re making the payment or somewhere else? wow 1.5%… Didn’t see that one in the communication. And when does the weekend end? 00:01 on Monday in whatever timezone? 08:00 in London? Goes by London time, I believe. Same as Revolut. Do you need to contact Amex to rescue them? They will reappear in a day or two. your points shouldn’t have disappeared – wait 2-3 days and if they are not back, give amex a call. Does your account need to be clear when upgrading from Gold to Platinum Amex? OT – does the Lloyds upgrade voucher need to be booked on BA metal like the BA Amex 2-4-1 vouchers? Planning weekend break to Geneva next month. Any recommendations on hotels and any deals out there (how I wish for those free nights of last year). Isn’t there a Ritz-Carlton too? No shortage of options but usually hugely expensive so best to redeem if you can. Has anyone made it into the No 1 lounge without buy a £5 admissions ticket? Every time I don’t buy one I can’t get in and every time I do pay for it, they don’t ask for it and the lounge isn’t crowded – even though it’s the same flight I’ve been catching! It seems you yourself got in without buying the £5 reservation, so not sure why you are asking the question? No, please re-read what I wrote. When I don’t buy it I CAN’T get in as they say it’s overcrowded or they are expecting more people. When I do buy one they don’t ask for it and the lounge isn’t crowded. They used to have an offer where you got a glass of champers for £7.50 along with the fast track. That I didn’t mind as inevitably normal security wasn’t too busy. Then you look at the message they were replying to and it’s actually someone pointing out their poor communication or questioning the value of curve, or any of the other things we’ve been hearing about in these comments. OT: I cancelled my free BA Amex credit card about a year ago, but I’ve recently applied for and received a new account – but I’ve seen no mention of any bonus in the letter or online (the spend tracker just shows spend to companion voucher). Is this normal – will I see it appear in a couple of days perhaps? I had the same thing. I left it a while, didn’t spend on it, then rang up to cancel the card and they gave me the bonus Avios plus what I would have earned on what I needed to spend to get it, so 7000 Avios in total. So, if anything, it’s a bonus ???? Nice! Thanks for the info! Same with my wife’s card. Asked on live chat and it was confirmed that the bonus tracker was there, just not visible to us. OT: Cheap flights ex Hong Kong about to end as fuel surchages reinstated? OT: According to the site with heat there is is exMAN deals on AA to key cities in USA ranging from £222-279. Good for anybody in the area looking for economy. Any idea how you book Interjet / check availability? I need to fly from JFK to CUN which is an interjet route. Iberia shows no availability for any date in the next year (yes, i tried them all as I’m sitting on a long layover). I’ve searched a few destinations in iberia.com that interjet fly with no luck on any dates. Obviously I can call them but IB CS is truly awful and ill-informed. Ideally looking to check the availability somewhere first. It won’t be online I’m sure, it will require you to navigate the IB call centre. As Interjet is not in an alliance I’m not sure there is any obvious way of checking availability. Thanks Rob. Thought as much. Will carve out some time and patience to give them a call. Will report back! Corker over on FT tonite – hat tip FT EC261 thread – BA just comes up with horsesh&t every time when you first claim EC261 compo – remember that, remember you won’t fall for that obfuscation, remember it’s the patsies that fall for it that allow BA to generously pay you your compo when you persist. “Flew BA115 LHR-JFK last Sunday. Maintenance issue with the cargo loading rollers. We were kept on the plane throughout and ultimately touched down 3h 4mins after scheduled arrival time. Arrived at the gate 3h 12mins late. Fired in a claim for the 300EUR and received the following. Do they employ people to make this cr*p up? Jet stream??? Being held at JFK??? Never had a taxi this short at JFK. Who are they proposing I claim – God? Maybe it’s his fault there was a jet stream… I’ve fired back a suitably robust response. Up to them whether they pay up or i need to go down the MCOL route again. At least they’ve admitted liability in the email for the maintenance issue that caused the delay. Should be an easy court process. Anyone seen anything as silly as this before? Thank you for allowing us to investigate the reasons for BA0115 flight delay. I’ve checked the details of your flight and can confirm your flight was delayed because of British Airways for 178 minutes. However the additional 14 minute delay was due to jet stream winds over the Atlantic and being held when arriving in JFK. Since British Airways was only reasonable for 178 minutes of the delay and not 180 or over we are not liable to pay EU Compensation. This is hilarious. Do they actually know what the jet stream Is? OT – Flying Ryanair BHX to DUB next week – which is the best lounge with Priority Pass (via Amex Plat) please? We have a review of the new Aspire South BHX lounge coming up over the next 2-3 days as it happens. Not read it yet so can’t tell you what it says! Make sure it’s published before Thursday please Rob!